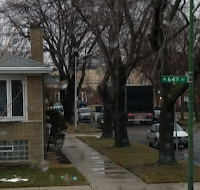 These trucks can seriously damage side streets, often in ways not immediately apparent. A transportation study conducted about a dozen years ago stated that one 80,000 pound truck can damage a road as much as 900 cars do. 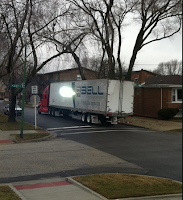 Heavy trucks cause stress to the pavement; and those stress fractures can expand over time, especially with the freeze/thaw/extreme heat cycles we have in Chicago. A few months ago, Clearing homeowner Kathy Owsianiak began having the same problem on and around her street, in the general vicinity of 63rd to 65th Street, in the blocks east of Narragansett. 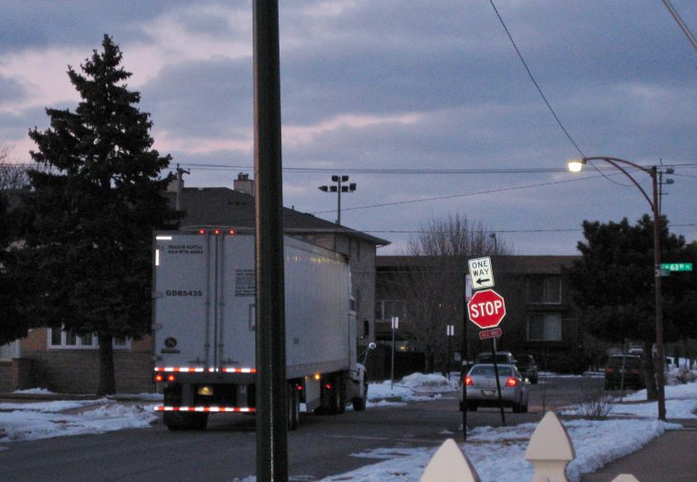 Although she has lived in that area for 27 years, she said that semis parading down her side street is a new thing. So she contacted city government and got the all-too-familiar runaround. No action, no action, oops we have no record of your call/what's your name again?, no action, no action, and so on and so forth. The Southwest Chicago Post caught wind of the situation and offered to assist. We contacted City Hall and started asking questions. We got ahold of the Chicago Department of Business Affairs and Consumer Protection, which is home to the city's Truck Weight Enforcement Unit. According to BACP, "(The unit uses) trucks equipped with portable scales. If they believe a truck is overweight and in violation of a load limit for a particular street or bridge, they will pull the vehicle over and weigh it. The program will have generated approximately $1,400,000 in fines for 2012. Their primary mission is to ensure trucks are operating within the scope of the law with regards to public way street and bridge load limits. In addition to staff enforcing this program on a daily basis citywide, they also respond to complaints." so what are you going to do? 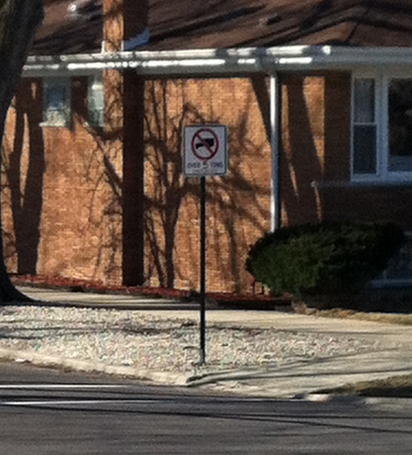 To their credit, they quickly sent a crew out and noticed that a "5 Ton Limit" sign was missing from a street corner. 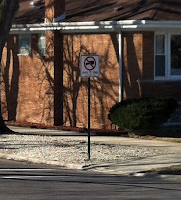 They then got the Chicago Department of Transportation to install one. Then, according to BACP, for the next five weeks "a Truck Weight Enforcement Unit monitored the area of Austin to Narragansett between 63rd Street and 65th Street on 23 occasions. As a result of this initiative, 12 citations were issued to trucks trying to take a short cut through a residential area posted as a No trucks over 5 tons allowed. We will continue to monitor the area to bring down the number of violations to a minimum." During the process, 13th Ward Alderman Marty Quinn jumped in and called Kathy Owsianiak to let her know he was on it, too, and that he had asked Eighth District Police to keep an eye on the situation. Finally, a few days ago, Kathy told us "Just wanted to let you know that today my husband saw a truck pulled over by one of the weight management vehicles near 65th and Narragansett. He also caught a semi trying to come down Mobile last week. He stood in the street, waving his arms and pointed to the new weight limit signs. The truck ended up turning down 63rd Place. One by one, hopefully, we will eliminate this problem." So it looks like city government is doing its job. If so, our praise to the Emanuel Administration for that. But we can't tell for sure, if only because BACP has refused our requests to ride along with them. "I need to let the inspectors do their job without trying to schedule something to accommodate a meet up," a BACP spokesperson told us. Well, that's weird, because just about every other department of city government will let reporters tag along to watch them in action. If you're using public dollars to enforce laws and serve in the public interest, wouldn't you want the public to get a glimpse of the good work you're doing? So as a fallback position, we told BACP that we did not need to ride along. Just tell us where the BACP Truck Weight Enforcement Unit will be and when, and we'll watch them from a distance. Any time government says "No, you can't watch what we do. But trust us, we're the government," that raises red flags for us. Hopefully, for you too. Anyway, if you think that big trucks are violating load limit regs on your side street, speak up and let City Hall know about it. Also, let your alderman know and the Eighth District CAPS Office. We pay taxes for these enforcement services. Let's use them. including their parking lot they lease to the CTA-- we get ALL this extra traffic)! But the trucks are doing the worst damage-- just tearing up the street, causing deep holes and massive cracking-- some extending from the sewers! Off and on over these years I've witnessed that our complaints would succeed in stopping these trucks using our street for their 'short-cuts' through the illegal roadway 'trucking lot' between Keeler and Pulaski Road, on their ways N/S to Archer or 55th Street and onward. But, it's started all over again. 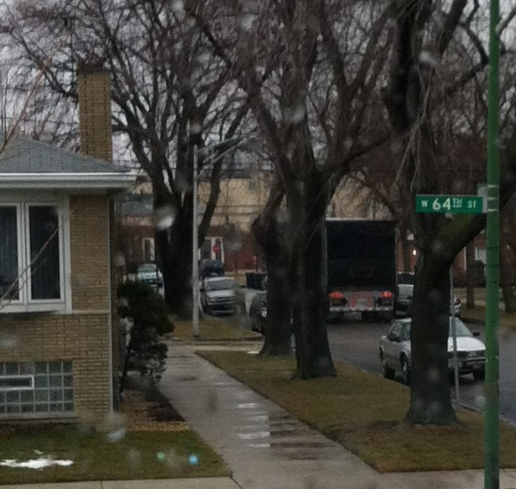 In the last several years, it seems trucks have re-invaded this stretch (esp. after a 'truck-driving school'--legally or illegally(?) in that same lot adjacent to Jewel Foods on Pulaski. And, once again, they're using residential Keeler Avenue as their 'short-cut' (when they should only legally be using Pulaski Rd). So, thank you for publishing this news and glad that Garfield Ridge was able to get some rapid help with their problem. And, I took your advice and sent my message to the city AND the Alderman Zalewski, and CAPS (and back to you, SW News Editor). Let's see if we are deserving of as much assistance in stopping these illegal trucks--as you fellow taxpayers and residents-- we are in fact, in the same ward, so should benefit likewise...right?